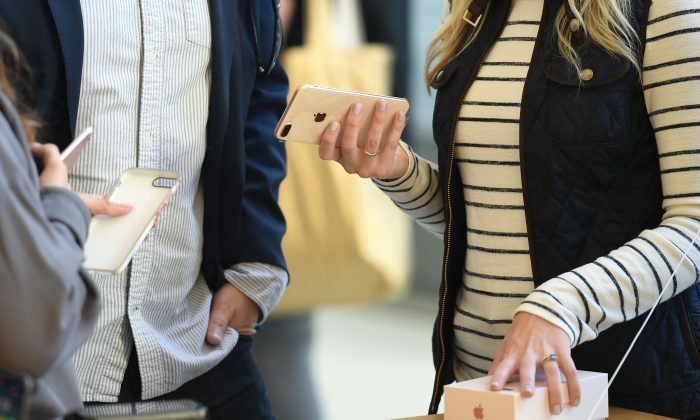 Apple Inc.’s older iPhone 7 models are outselling the recently launched iPhone 8 ahead of the early November debut of the premium iPhone X, broker KeyBanc Capital Markets said, citing carrier store surveys. Traditionally, new editions of the iPhone have sold quickly as fans queue for the latest upgrade, but early surveys have added to chatter that the iPhone 8 is not proving to be as popular as its predecessors. U.S. wireless carrier AT&T said its third-quarter postpaid handset upgrades were fewer by nearly 900,000 from a year ago, and brokerage Jefferies attributed it to weak iPhone 8 demand. “Many respondents indicated that a meaningful portion of customers are buying iPhone 7 in lieu of the new iPhone 8, given the lack of significant enhancements in the new phone,” KeyBanc analyst John Vinh wrote in a client note. Vinh also said feedback from stores indicated that customers were waiting to purchase the iPhone X or to compare the iPhone X with other models before buying the iPhone 8. Apple last month introduced the iPhone 8 and iPhone 8 Plus, which resemble the iPhone 7 but have a glass back for wireless charging. While iPhone 8 starts at $699 in the United States, iPhone 7 is retailing from $549 after a price cut. The iPhone X, a glass and stainless steel device with an edge-to-edge display, will start shipping from Nov. 3. The 10th-anniversary iPhone is priced starting at $999—Apple’s most expensive mobile to date. One investor in Apple’s shares played down any concern around a dip in sales of the iPhone 7 or 8, given the much-anticipated debut of iPhone X. “Worrying about any small down-tick in margins from the sale of the iPhone 7 or 8 is a wrong-headed way to look at it, as iPhone X is really the flagship device where we’re going to see a strong upgrade cycle,” said Jason Ware, chief investment officer of Albion Financial Group. Another reason for the slow uptick of the iPhone 8 could be the modest promotion by U.S. carriers. “While carriers continue to offer promotions for the new iPhone 8, they have been much more modest compared to the iPhone 7 launch last year,” Vinh wrote. Separately, KeyBanc’s Andy Hargreaves upgraded the stock to “overweight” from “sector weight” and set a price target of $187. VR Technology Gives New Meaning to ‘Vacationing at Home.’ But Is It Really a Substitute for Travel?